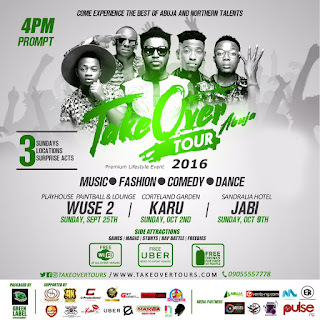 Take Over Tour Abuja 2016 is the first ever tour in Abuja scheduled to hold from September 25th to October 9th 2016. The 14-days event features a blend of music, fashion, comedy and dance. Side attractions include; games, give-aways, rap battles and contests. It is a gathering to meet, network, have fun, eat in a creative atmosphere. The aim of this tour is to promote Abuja and Northern talents and brands, create opportunities for investment in the entertainment industry and to take entertainment to local communities. Thus, the event is scheduled to hold on three Sundays back to back at three different locations in the FCT. Sunday, September 25th 2016: Playhouse Paintball and Lounge, City Park, Wuse 2, Abuja. Sunday, October 2nd 2016: Corteland Garden, after Karu Market,Karu, Abuja. Sunday, October 9th 2016 (Grand-Finale): Sandralia Hotel, Jabi, Abuja. Morell, LK Kuddy, Tony Wenom, 4Reign, Shortcut, Ambassador Wahala, Nick B, Pherowshuz, Prokassy and other exciting acts. The host of the tour is popular OAP, MC and Voice Over Act; Bigmo of WazobiaFM Abuja. There will be three surprise acts on the tour. The TOT is already gaining massive popularity in the North, it is one of the most anticipated and talked about events of 2016. It attracts talents from the FCT and states in the Northern region which includes Plateau State, Kano State, Niger State, Kogi State, Nasarawa State, and Benue State. 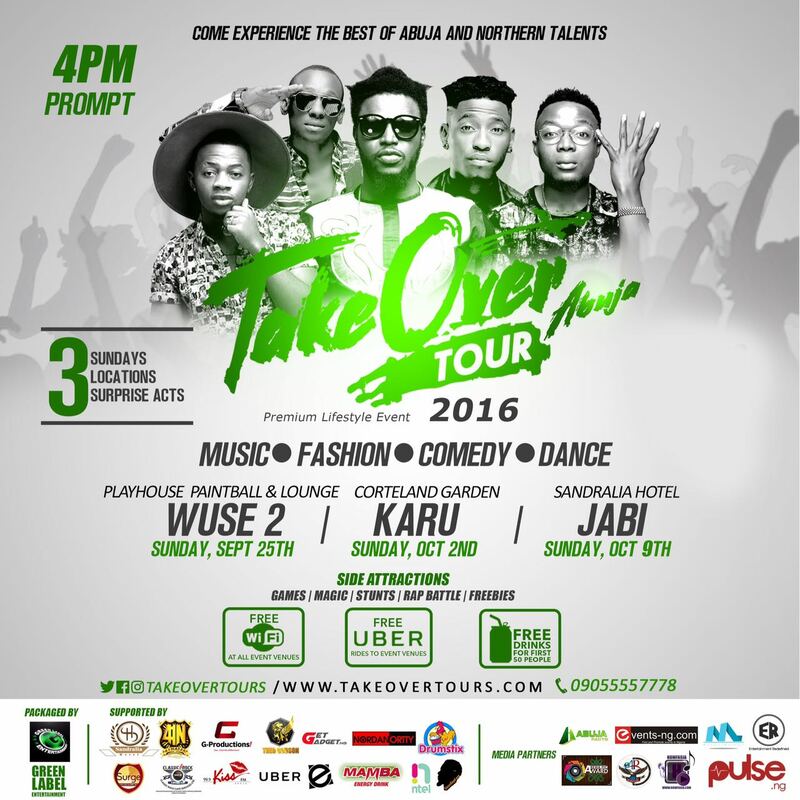 Take Over Tour is a registered trademark and initiative of Green Label Entertainment Productions Limited; a Media and Entertainment company. This event is proudly supported by Sandralia Hotel, 41Naija Entertainment, G Productions Ltd, Classic Rock Coffee Company, Theo Godson Company, GetGadget, Nordan Ortty Music, Ntel, Uber, Emagination, Kiss FM Abuja, Mamba Energy Drink and Pulse Nigeria.